I have already posted a tutorial on how to make a child-sized kilt. The only difference between that and making an adult version is the dimensions, so I won't explain the process all over again! The main trick to keep in mind is that whatever your waist circumference is, divide it by two, then multiply it by three to figure out the finished length of the waist of your kilt. Working the waist in three sections, two identical flat panels that overlap in the front, and one pleated panel in the back, makes this project a lot easier than it looks! The only hard part is figuring out how much material to allow to get the number and thickness of pleats you want. I usually allow 4" to create a 1" pleat. 72" + 18" + 18" = 108" For this kilt I would need 108" of fabric by however long I wanted it to be. Once pleated, this length will equal 54". Not quite the 8 yards of the traditional Scottish kilt, but it looks good and is a lot cheaper to make! Here I am with my brother-in-law and husband sporting the latest in Scottish fashion! The boys demonstrated some "traditional" sword-fighting techniques. I am not one to be outdone so later in the day I also did a bit of sword-fighting. We engaged in some traditional Highland games including the sheaf toss, the throwing of the Wellie (a boot), a simplified caber toss using landscape timbers, and the stone put (or rock throwing!) My best event was surprisingly the caber toss. Here is my daughter in her kilt. I had just enough fabric to make her a sash to wear as well. Hers was made of the same fabric as mine (which was the closest I could find to the actual Leslie tartan). I discovered that day that I enjoyed wielding a sword much more than I thought I would! 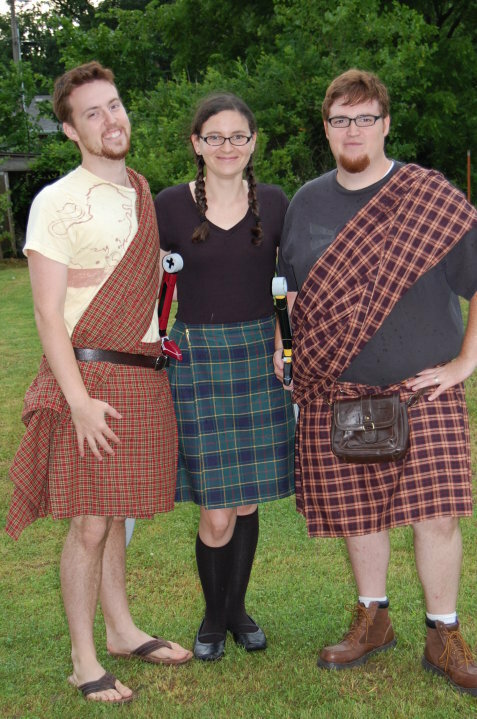 I recommend sewing up some kilts for your clan, Scottish or not, and having some Highland games. It's a lot of fun! this is awesome! thanks bethany! Everyone can discover something they enjoy in the world of video gaming. Preschoolers could find out basic math, grandmothers can rule the globe, and everybody could get some kind of enjoyable from the experience. Keep checking out into the following article for even more about the benefits of video free vbucks, as well has exactly how to take advantage of them. Everyone can discover something they enjoy in the world of video gaming. Preschoolers could find out basic math, grandmothers can rule the globe, and everybody could get some kind of enjoyable from the experience. Keep checking out into the following article for even more about the benefits of video blog, as well has exactly how to take advantage of them.